As a multitasker, I love multi-purpose products. Anything that can hit two or more beauty uses for me immediately gets my vote. The new Givenchy Hydra Sparkling Magic Lip & Cheek Balm is not only a huge time-saver, but it adds that little je ne sais quoi to your look instantly. At first glance, the little blue tub with gleaming silver cap seems quite innocent. But once you unscrew the cap, you find a beautiful pink balm just waiting to bring you happiness and joy. A simple swipe across the cheeks leaves a beautiful pink flush, while lips enjoy a rosy glow. 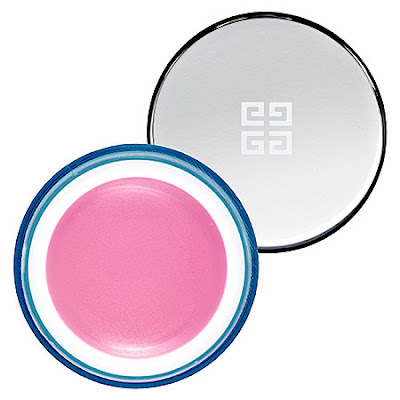 But it's what's inside this pretty pink balm that really makes the difference. Luffa Oil contains lipids rich in fatty acids to moisten and soften the skin, while water-soaked spheres of Hyaluronic acid moisturize and provide a gentle plumping action. Givenchy Hydra Sparkling Magic Lip & Cheek Balm retails for $31 at sephora.com.